More coral reef species than anywhere else on Earth. Six of the world's 7 marine turtle species. A 6-million km2 ecosystem that fuels economies and supports the livelihoods of more than 100 million people. 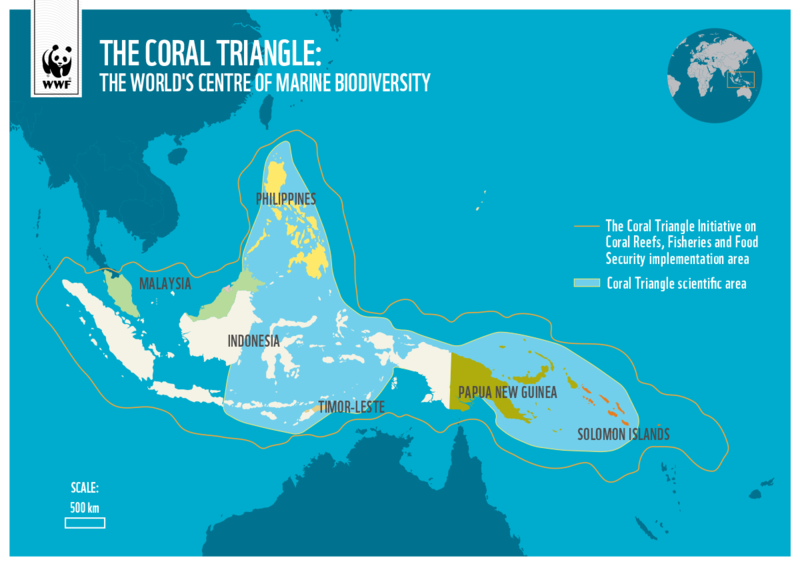 This is the Coral Triangle. The Coral Triangle is a marine region that spans those parts of Indonesia, Malaysia, Papua New Guinea, the Philippines, the Solomon Islands and Timor-Leste with at least 500 species of reef-building corals. The Coral Triangle encompasses portions of 2 biogeographic regions: the Indonesian-Philippines Region, and the Far Southwestern Pacific Region. 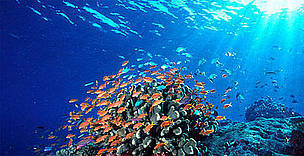 Fiji is famous throughout the world for spectacularly rich and vibrant soft coral reefs. Fed by nutrient rich currents, these soft coral gardens are havens and food sources for thousands of species of fish and invertebrates. Soft, corals, hard corals and anthias fish, Fiji. 6 of the world's 7 marine turtle species, including the leatherback marine turtle, found in places such as the Northern Bird's Head Peninsula / Waigeo region, Papua (Indonesia), as well as Lea region (Papua New Guinea), New Georgia (Solomon Islands). 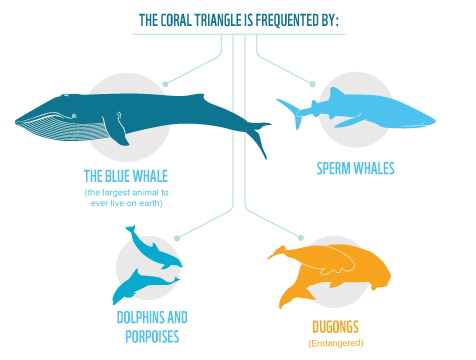 Why the Coral Triangle (and not a circle)? 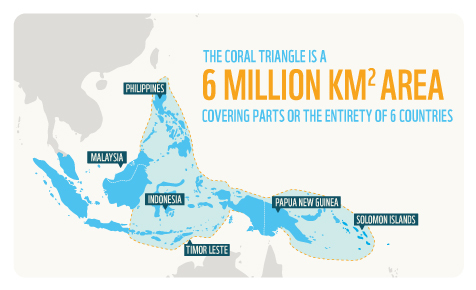 The Coral Triangle is defined by marine zones containing at least 500 species of reef-building coral—the darkest area that is roughly triangular in shape shown in the map above. Certain neighbouring countries, including Australia and Fiji, contain rich coral biodiversity as well, but with somewhat lower numbers. The Coral Triangle region is highlighted below in blue. 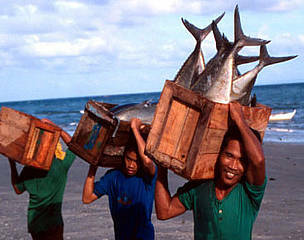 The Coral Triangle supports livelihoods and provides income and food security, particularly for coastal communities. Resources from the area directly sustain more than 120 million people living in the area. The Coral Triangle is part of an area that has emerged as one of the planet’s economic hubs. Fast population and economic growth have fuelled unsustainable coastal development and boosted demand for expensive marine resources such as tuna, shark fin, turtle products and live reef fish.